Womens Vintage 1970's Levi's "BIG E" Pants! 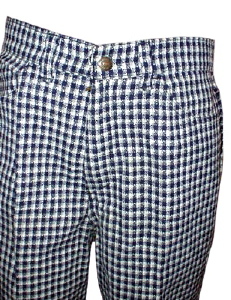 Navy Blue and Light/Dark gray come together in this eye-dazzling checker pattern! Fantastic for 1970's parties, or ska-bands. Classic Levi button closure in the front, with belt loops all around. Two classic pockets in the front with two patch pockets in the back. Tagged by "Levis for Gals". No material tag, feels like wool on the outside, but its most likely acrylic (smooth inside). Condition: Good+: Has some discoloration on the front, but pattern is too distracting to really notice.